A 30 something friend is having a birthday coming up and I decided to embellish a set of wine glasses. I used my Cricut Expression to cut the design for the glasses. Glass etching with Armour Etch Cream is an easy way to dress up "plain Jane" items from the department store or dollar store. I love the design you chose! I've done a few monogrammed glasses, but next time I might dress them up with something similar to yours. Thanks for sharing! Thanks for the encouragement Vanessa. 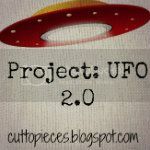 I am really enjoying this-the blog and your designs-great inspiration-and ideas! I'm gonna have to keep up with your blog! Hard to believe your house issues-but Jack can fix anything and you are always doing something great!